Nazghor was born during the winter of 2012, hailing from the deepest abyss of Uppsala, Sweden, this horde was created by vocalist Nekhrid and guitarist Armageddor with only one purpose to bring a pure, raw but yet melodic black metal and deliver a closer view of satanism in form of a darker, ceremonial, and ritualistic show, the dark message of Tartaros is delivered by unholy words that shroud the starry skies, the band is conformed by guitarist Angst who was recruited, from the ashes of an old group of dedicators, and later on bassist Crowlech joined the legion, currently during their live rituals they count with a guest drummer. I have to admit it, previously "Diabolical Teachings" which was released last year, never before I had heard of them or listen any early recordings. So when I find them it was a gratifying experience, the kind of black metal this guys are able to bring is ripping, stinging with blasphemous tremolo picking guitars as hell itself, thunderous blast beat, very well accentuated by disturbingly and devilish high pitch vocals, that's what we can get from their fifth and latest album "Death's Withered Chants", it's defiant to the mainstream black metal of nowadays. 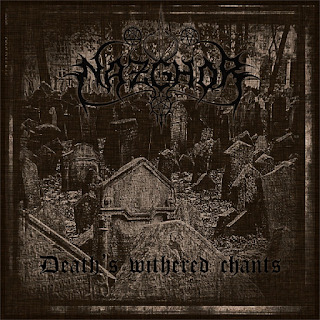 Nazghor sounds impressive not only for the fact that they are Swedish, they gathered enough elements of the whole scene to blend and give us their most brilliant work to date, the record opens with a beautiful intro "Hymnum Mortis" built in organ notes to inflict an eerie and funebre ambience, intensified by chants and thunderstorms followed by the rabid and fulminant "Requiem Black Mass" which set everything over the table and prove why this band, has reached so quickly the top underground scene, with such melodies and brutality it's inarguably the creativity and conviction they have, "Under the Venomous Spell" subtle start that turns into a storm very intense almost reaching a sublime point for the driven speed used by the drums with it blast beat that shatter harmoniously, flashing guitar riffs and the ominous vocals make of this track one of the best, Anders Strokirk from (Necrophobic) make a guest appearance in the track number four "Craft of the Nihilist" giving the proper vocal style, owning an overwhelming guitar solo, while the drum patterns seems to be unstoppable, "Road to Dead Meadows" has a singular entity and never step back for a second in the ferociously and speed delivered, track after track you can find out how meticulously are this guys "Inheritance of the Cross" falls into a blackened riffing, while "Aeternum Regno Diaboli" add a droning passage in the album, only to unleash the devils towards the end "Complete Unholyness" is very raw and combine exceptionally from fast pace to semi-slow pace adding an epic mood, "Empire of Graves" does not lack of intensity, until we get to the last track "Death's Withered Chants" it reaches a little over ten minutes, from afar you can perceives a thunderstorm which seems to start where the intro left, then a slow pace takes over with heavy and mesmerizing dark melodies, lofty backing vocals gives a stunning perspective to the whole environment, by the end you will hardly notice the length of the album due to the excellent flow of the tracks. In summary this album takes a hell within the songwriting, the ceaseless raw but melodic black metal recalls bands like Dissection, Dark Funeral, Necrophobic or Dark Fortress just to mention few top bands of the genre, however the strongest critics could fall more upon the band genuineness, because many will point there is nothing new here, but cohesiveness and effectiveness are a must to stand out, they succeed to enthrall the listener for almost one hour, track after track you will feel a torrential flow of melodic aggression as you have not felt it for a while, indisputably a serious contender to add in the end year list.